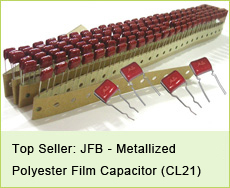 Due to jb capacitors JFV series X2 film capacitors high quality, good prices, and short lead time, we win many customers, many orders, sales volume have been increasing greatly. 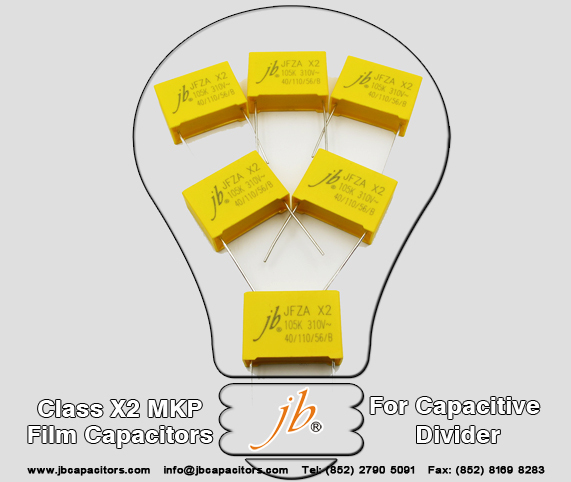 To give customers more professional and better services, jb capacitors company enlarged the X2 capacitors production lines, and soon, JFV X2 film capacitors will get ENEC, VDE approvals for 305VAC, 310VAC. 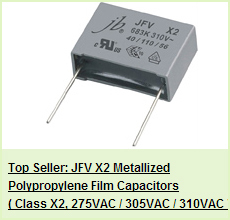 JFV X2 MKP Film Capacitors have best Ammo pack, Tape & Reel package. 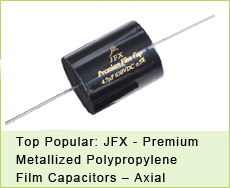 JFV --X2 Metallized Polypropylene Film Capacitors, Safety capacitors. Voltage : 275VAC, 305VAC, 310VAC. Approvals : TUV, CE, UL and RoHS SGS. Simple Cross Guide: Kemet Arcotronics R46, Panasonic ECQU, Vishay MKP3382, Epcos B81130, Evox Rifa : PHE840M. ------ISO 9001:2000 manufacturer for MKT, MKP ,MKS Film Capacitors since 1980.